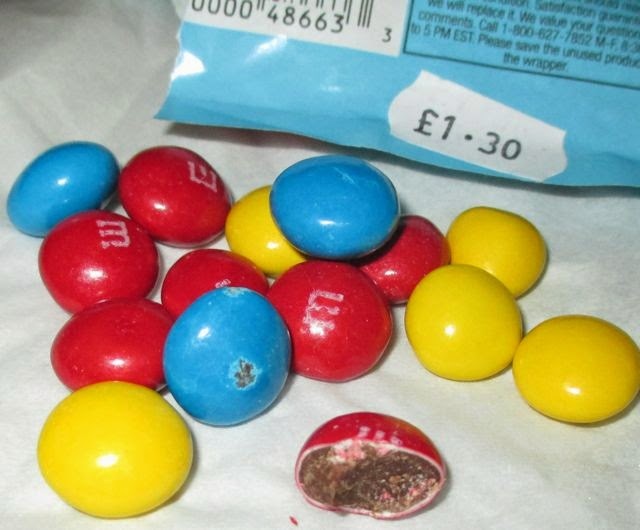 M&Ms in the UK aren’t very adventurous, we don’t have limited editions or specials. Well, occasionally we have a Christmas edition but it is just regular milk chocolate M&Ms, but with green and red shells, yay a possibly some christmas deco on the wrapper! Even the M&Ms World store in London offered me no new flavours when I visited, which was quite surprising at the time, but I did pick up a fab hot pink t-shirt featuring ‘Green’… but I digress. Anyway I went to an import shop so that I could get a taste of some of the goodies that get released across the shore. The latest edition in The States is this Birthday Cake variety, which sounded rather different when I saw it. It is a strange concept though, are you only supposed to pick them up on your birthday? Or give them to someone celebrating? My birthday may well be in January, but I eagerly picked up a small pack for £1.30 and brought them home anyway. 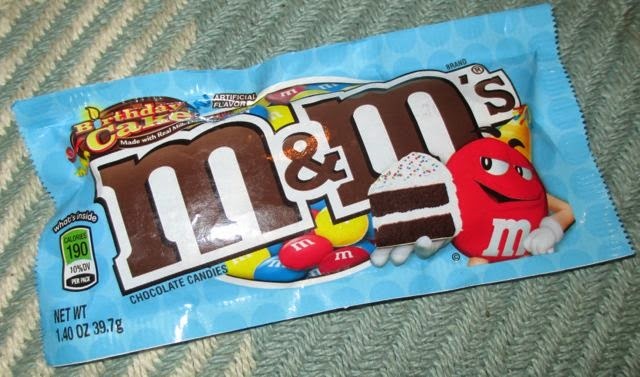 Once open the M&Ms looked quite large, but smelt rather like the regular sweets. I gave one a taste, expecting a sweet vanilla flavour, with a hint of baked sponge and essentially just got milk chocolate. I think there was a bit of extra sweetness in there, but I couldn’t really tell if I’m honest. I have to admit finding these a bit of an anticlimax in terms of birthday cake flavour, but still enjoyed them as they were sweet and tasty. Nice, but not exciting enough to warrant the price premium in the import shop.